This is something I have been thinking about for a long time...if you have an item that is intact and in good condition, should you take it apart for a different use? For example, a vintage dress is in great condition but you don't like the bodice style, so you make it into a skirt. Or, in this case, a vintage book...maybe I want to take it apart and frame some of the pages. I was thinking that if you could do it without any waste, then it should be fine. In the case of the dress, if you make a skirt and then just throw the bodice away, that would be unfortunate. Or in the case of the book, what do you do with the pages that you don't like and the cover? My other thought was that vintage items have a certain value and when you alter them, they lose that value and may not be sellable when you are done with them in their new use. These are the things that go on in my head as I work to be a good steward of my resources, if you have any thoughts, I would love to hear! Oh man I know this dilemma all to well! I used to think it was ok to alter a vintage dress if it meant I would get more use out of it, but now I have gone much the other way and try to preserve these vintage items as much as possible. I sometimes regret the things I have altered because I totally stripped that item of it's vintage value. As for the books, I find now when I have a book with a great image, I will make a good quality copy of the image instead of ripping out the page. This way I can preserve the book in it's original state and still enjoy it's beauty in a different context. With my business I take the role of preservationsist and recycler. So I do believe in reclaiming and repurposing items that would otherwise end up in a landfill. But there is the otherside of the spectrum where as the preservationist I do not believe in taking something that is perfectly intact and altering/deconstructing it just to make it conform to my aesthetics or for an impulse or a trend, those pass. I feel altering something that is in a sense a time capsule would be stealing something from future generations. I can't fathom people taking apart a perfectly good book so they can craft with the pages.... make photo copies!! I have the same problem. I love love LOVE vintage dress patterns and if they have been cut and used, I use them to make my own creations without any question. Occassionally (and by that I mean twice) I've come across an amazingly beautiful dress pattern that was uncut and looked like it was never even taken out of the envelope. So what do I do? Do I take it out and cut it up and bring that era back to life in my wardrobe? Or do I leave it in it's glory sitting in my sewing box doing nothing? It's a really difficult decision. But I can tell you that I still haven't cut it up and used it because I just can't bring myself to do it. In the case of the books, if you have several that are similar or close, maybe sacrificing one would be good? I have been mulling this over and still don't have a firm answer. 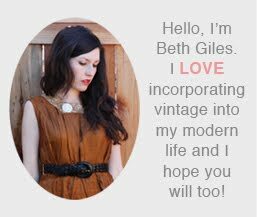 It seems to me that in the case of vintage clothes that are in good, wearable condition, selling what doesn't suit or fit you is a good solution. I would only drastically alter something that I like but feel cannot be worn as is. I'm really not sure about books, though there can be different ways to use different parts of them— like framing some, all sorts of ephemera uses (decoration, stationary), and covers can be turned into notebook covers (I would love to do that with some of the books on your photo!). This is something that always crosses my mind whenever I go vintage shopping. And I've bought a number of things that don't really fit me but as I can't bring myself to alter them, I end up giving them to friends who look better in them or selling them. As for books, I like to keep them in their original state. It seems like sacrilege to cut them up especially if they're going out of print. Your children's books look so wonderful. If you ever decide to sell them, please please let me know!! I'd take them in a heartbeat!! That is a problem! I often try to break it down: am I (or someone else) going to enjoy this item more if it's broken up, framed, on display, worn and loved? Or is it going to hang in a closet, on a shelf, in a drawer - never quite right? I would much rather see the whole china cabinet sprinkled around the house than locked away - for who? Posterity? Thanks!